With only a few days left in the 2016 election campaign, most national and swing state polls indicate that Hillary Clinton is favored to defeat Donald Trump in the presidential election. Democrats also appear to have a decent chance to pick up at least four Senate seats and thereby take back control of the upper chamber (with a Vice President Tim Kaine breaking ties if it’s 50-50). When it comes to regaining control of the House of Representatives, however, Democrats’ chances do not appear to be very good. Most political observers, including the Crystal Ball, agree that Democrats are unlikely to gain the 30 net seats they need to retake control of the House even though recent polls give them a lead of around four points in the national popular vote for the House of Representatives. Why are Democrats struggling to pick up the 30 seats they need to take back the House of Representatives despite their lead in the national popular vote? The explanation, according to most observers, is that current House districts, drawn largely by Republican state legislatures in the aftermath of the GOP’s sweeping victories in the 2010 midterm elections, make it almost impossible for Democrats to gain 30 or more seats in the House. There are simply too many Republican-leaning districts for Democrats to win a majority of seats even if they win a majority of the popular vote. Thus, in the 2012 House elections Democratic candidates won more than 1.4 million more votes than Republican House candidates — a margin of about 1.2 percentage points. But despite their popular vote margin, Democrats only won 201 House seats, well short of the 218 needed for a majority. This year, just as in 2012, Democrats appear to face an uphill battle in trying to win back control of the House of Representatives. Only 28 of 247 House Republicans currently represent districts that were carried by Barack Obama in the 2012 presidential election. Democrats would have to capture all of those seats and at least two more seats in districts won by Mitt Romney in 2012 in order to reach the magic number of 218 — a tall order indeed. Thus, while Democrats are likely make gains in the House elections, according to most of the experts it would take an electoral tsunami for Democrats to defeat enough Republicans to win a majority of House seats. By how large a margin would Democrats have to win the national popular vote in order to win a majority of House seats? And to what extent is Republican gerrymandering responsible for Democrats’ difficulties in House elections? My analysis of the results of House elections between 1980 and 2014 indicates that Democrats do face a difficult task in trying to win a majority of seats in the House this year. In fact, they would need to win the national popular vote by at least four percentage points in order to win a majority of House seats. However, contrary to what most pundits and political observers believe, the main problem that Democrats face in trying to regain control of the House is not Republican gerrymandering but the advantage of incumbency. The advantage of incumbency in House elections is well known. Individual incumbents are able, on average, to add a few points to their party’s normal vote share by cultivating their constituencies and, in most cases, by greatly outspending their challengers. What is not as well known is that the majority party also enjoys an advantage based on the number of seats it holds going into an election. Even after controlling for the majority party’s share of the national popular vote, the number of seats it holds prior to an election has a positive effect on the number of seats it can expect to win. Table 1 displays the results of regression analyses of House election outcomes between 1980 and 2014. Two different models were tested. In both models, the dependent variable is the number of seats won by Democratic candidates in the election. In the simple incumbency model, the independent variables are the national popular vote margin for Democratic candidates in the election and the number of seats held by Democrats prior to the election. In the incumbency plus gerrymandering model, the independent variables are the national popular vote margin for Democratic candidates, the number of seats held by Democrats prior to the election and a dummy variable for the two elections that took place after the post-2010 round of redistricting. If gerrymandering by Republican state legislatures had an effect on party fortunes in the 2012 and 2014 elections, this variable should have significant negative coefficient. The results displayed in Table 1 show that the simple incumbency model does an excellent job of explaining the outcomes of House elections between 1980 and 2014. This model explains a very impressive 96% of the variance in the number of House seats won by Democrats with a standard error of only six seats. The estimated coefficients for both independent variables are highly statistically significant and substantively important. For every additional one point of margin in the national popular vote, Democratic candidates win about 3.7 additional House seats. In addition, even after controlling for the popular vote, there is a strong effect of Democratic seats: every 10 additional seats that Democrats hold prior to an election results in Democratic candidates winning almost four additional House seats. Since the number of seats held by each party prior to an election is highly correlated with the number of incumbents running for each party, these results indicate that incumbency has a substantial impact on House election outcomes over and above any effect that it has on the national popular vote. It appears that incumbents are able, to some extent, to insulate themselves from the effects of national electoral tides. Just as incumbency insulated Democrats from national electoral tides during the 1980s when the party held big majorities in the House, the huge losses that Democrats suffered in the 2010 midterm election put them at a severe disadvantage in the 2012 and 2014 elections. But what about the effects of Republican gerrymandering on the 2012 and 2014 elections? The results displayed in Table 1 indicate that any effect of GOP redistricting on these elections was quite small. The estimated coefficient for the Post-2010 dummy variable is only five seats and is not close to statistical significance. Moreover, adding this variable has almost no effect on the overall accuracy or predictive power of the model — the adjusted R2 only shifts from .956 to .957 and the standard error of the model only falls from 6.01 to 6.00. 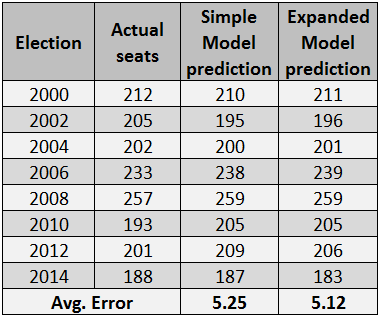 Table 2 compares the predictions of seats won by Democrats in House elections between 2000 and 2014 based on the simple and expanded models. The results once again demonstrate that adding the post-2010 dummy variable to the model makes almost no difference. For all eight elections, including the 2012 and 2014 elections, the predictions of the two models are almost identical. The average absolute error for the simple model is 5.25 seats while the average absolute error for the expanded model is 5.12 seats. The coefficients for the simple model indicate that once the impact of incumbency is taken into account, there is no Democratic disadvantage in House elections. Based on these results, if Democrats hold 218 seats going into an election and there is a tie in the national popular vote, Democratic candidates should win about 215 seats in the House of Representatives, only three seats shy of the 218 needed for a majority. This means that if Democrats are able to win a majority of House seats in 2016, the party would not face any disadvantage in House elections after 2016 due to the effects of Republican gerrymandering. We can use the results for the simple incumbency model in Table 1 to estimate how large a margin Democrats need in the national popular vote in order to regain control of the House in the 2016 election. 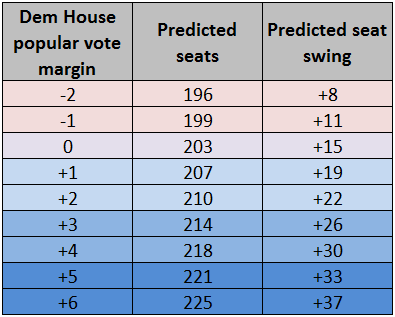 Table 3 displays predictions of the number of seats Democrats would win based on their margin in the national popular vote for the House. Because Democrats are at a disadvantage due to holding only 188 seats going into the election, a tie in the popular vote would be expected to yield only 203 seats, a gain of 15 seats but well short of the 30 seats needed to become the majority party. According to these results, Democrats would need to win the national popular vote by at least four points in order to regain control of the House. If they win the national popular vote by four points, their average lead in recent polls asking the generic ballot question, they would be expected to hold a narrow 218-217 seat majority in the 115th Congress, their first majority since the 2010 midterm election. Moreover, the results presented here indicate that post-2010 Republican gerrymandering would not be an obstacle to holding onto that majority in 2018. Democrats might very well lose their majority in 2018 if there is a Democrat in the White House, but that would have nothing to do with Republican gerrymandering in 2011. For another analysis that reaches very similar conclusions using a different approach and different data, see Michael Barber’s “How Incumbency, Not Gerrymandering, May Protect the Republican House Majority,” on the The Washington Post’s Monkey Cage Blog.